While many in the SEO industry have predicted a Panda or Penguin Google algorithm update in the near future we know, without a shadow of a doubt, the April 2015 upon will focus on mobile searches. 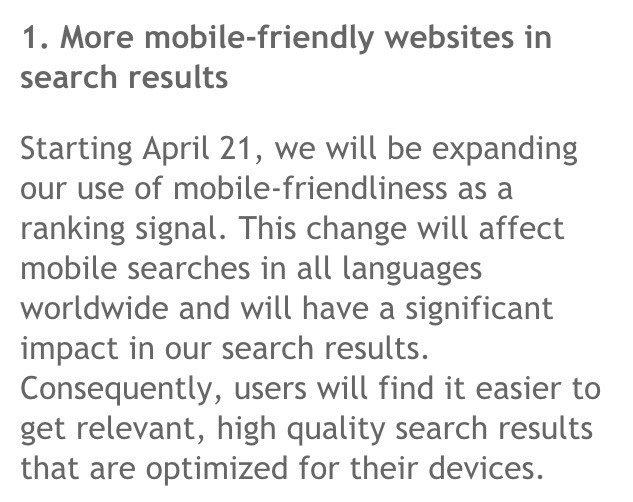 On April 21st, 2015 Google will adjust their algorithm where only mobile friendly websites will show up in mobile search. If you are a business and your website is not mobile friendly you could see a huge drop in search traffic as early as April 21st, 2015. If you would like to upgrade your website to become mobile friendly please feel free to reach out to me at jwojdylo@gmail.com. Website owners have many ways to prepare for this change. If you are a WordPress webmaster there are a number of great plugins you can use to make certain your website is mobile friendly. You can also download a theme that is responsive. If you have a WordPress website that was built in the last two years there is a high likelihood that your website is already mobile friendly. If you have Joomla or Drupal you may have to go through your web design company to make certain the website is mobile friendly. If you are using older software like Microsoft Frontpage it might be time to upgrade to WordPress. There are other industry specific websites such as Justia, Findlaw and Real Pro Systems that may have mobile friendly websites as an added option. If you find that you are getting more than 10% of your search traffic from mobile it would be a smart decision to add this on as soon as possible. As a business owner you must decide how important Internet traffic is to your business. I know many business owners that have so much business through referrals that they have no desire to even create a website. That said, it is hard to deny the fact that some businesses have been able to expand because of their web presence. I have several clients that receive so many phone calls they have to hire extra employees simply to answer the calls and set up the appointments. When looking to expand your Internet presence there are more steps than simply creating a website. You will need quality content that is consistently updated on your website. You will also need natural links that point back to your URL. Proper optimization of your website could determine if you are on the front page of Google or buried on page 15 of the search results. If you would like for your business website to rank higher in Google search please feel free to reach out to me at jwojdylo@gmail.com. I have several monthly packages that can help you get more business through Google and Internet search.